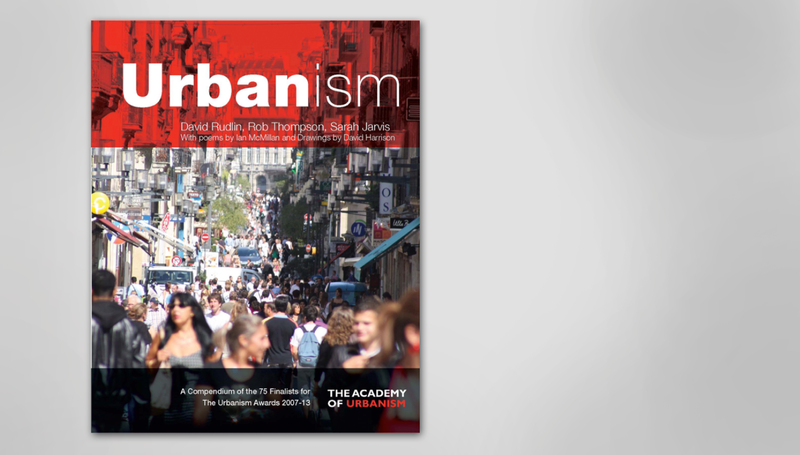 We are happy to announce that our third book Urbanism is out now! The Academy of Urbanism was founded in 2006 with a mission to recognise, encourage and celebrate great places across the UK, Europe and beyond, and the people and organisations that create and sustain them. This book is a compendium of 75 places that have been shortlisted as part of the Academy’s annual awards scheme which covers great Places, Streets, Neighbourhoods, Towns and Cities. Included are Urbanism Awards finalists shortlisted between 2009 and 2013. Each has been visited by a team of Academicians who have spent time in the place, talked to officials and local people and sought to understand what it is that makes them special and how they have achieved what they have achieved. The Academy also commissions a poem, a drawing and a figure ground plan to understand and interpret the place. David Rudlin, Rob Thompson and Sarah Jarvis have drawn on this treasure trove of material to tell the story of these 75 places. In doing so they have created the most comprehensive compendium of great urban places to have been published for many years. The book is available to purchase at Routledge. David Rudlin is a director of URBED, Honorary Professor at Manchester University and winner of the 2014 Wolfson Economics Prize. He started his career working on the redevelopment of Hulme in Manchester and has been at URBED since 1990. He is the author of the book, Sustainable Urban Neighbourhood, published by Routledge in 2009 which was described by Richard Rogers as “the best analysis he had read of the crisis facing the contemporary city.” He is also joint chair of the Sheffield Design Panel, chair of BEAM in Wakefield and a director of The Academy of Urbanism. Rob Thompson is an urbanist and planner with close to 25 years’ experience working on a range of urban design and master planning projects in local government and in the private sector. He spent 11 years with Sheffield City Council providing design guidance on major developments and coordinating the city’s design panel. Rob’s interest is focused on how emotional experience can influence and dictate the success of a place. Alongside his long standing relationship with Sheffield School of Architecture, he has also run a successful studio at the institution. Rob currently sits on the Yorkshire and Humber Design Panel and is an Academician of the Academy of Urbanism. Sarah Jarvis is a writer about cities who has tried out several for size, living in Paris, New York and Dublin before settling in London. Since studying Geography at Cambridge University Sarah has been exploring different ways to understand, communicate and actively influence how places work – from journalism and travel writing to academic research and consultancy. Sarah has an MPhil in Urban Planning from the Bartlett School UCL, and has worked on projects that range in scale from assessing urban renaissance across England to neighbourhood planning …in Bankside. She also explores places visually – taking on commissions as an artist to examine the processes of change up close.